ELECTION CAMPAIGNS are crucibles: the heat can reveal a candidate's character in unexpected ways. 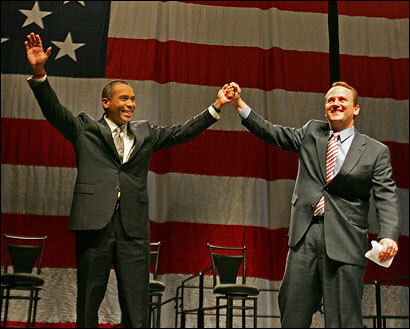 In recent times few candidates have had their mettle tested as much as Deval Patrick, the Democratic candidate for governor. Patrick has withstood a withering personal assault from his Republican opponent and from a talk-radio political culture that polarizes and demeans. Through it all, the first-time candidate has kept his dignity, refused to be dragged into the mudslinging, and honored the promise he made early on to his supporters to promote "a new kind of politics" -- a kind that emphasizes common goals. What that says about Patrick's character is just as impressive as his high-powered résumé, his thoughtful issue positions, and his stirring appeal to new voters. We are delighted to endorse his candidacy for governor. Patrick brings an unusual set of experiences and values to the Massachusetts political landscape, and the state is better for it. He has a solid executive background both in the public sector -- as chief of the civil rights division in the US Justice Department -- and in the corporate world, as a lawyer for Coca-Cola and Texaco. He grew up poor and mostly fatherless on the South Side of Chicago and was blessed with extraordinary chances that brought him to Milton Academy and Harvard. His personal history resonates with chords in the American anthem that seem almost too corny to sing out loud: opportunity, hard work, community, justice. When he says he wants to extend those opportunities to others, the voters can believe it. With his candidate for lieutenant governor, Worcester Mayor Timothy Murray, Patrick should build a team that understands the needs of the struggling cities and towns while reaching for innovative solutions to some of the state's most intractable problems. The issues dominating the campaign have, until quite recently, been sideshows -- ugly distractions from the central questions voters have about Massachusetts: Can I afford to stay here? Can I learn, and grow, and prosper? Patrick and Murray have offered a solid and achievable plan for continued improvements in education; investments in new technologies, especially in energy and biotechnology; expanded housing development to lower prices; and tax relief where it counts: the regressive and spiraling property tax. Despite claims by his opponents that Patrick has made a long, budget-busting list of promises to special interests, his immediate priorities are rather modest. He wants to add 1,000 police officers to local communities (cost: $85 million, or less than one-half of 1 percent of the total state budget). He wants to expand the circuit-breaker limit on property taxes for the elderly so that more residents are eligible (cost: $60 million). He wants to implement the state's landmark universal healthcare law -- slowly and carefully, without drama. Other more sweeping investments, in universal early education, for example, will have to wait until the economy rebounds. Perhaps Patrick's most distinctive quality is his open, balanced approach to problem-solving, marked by a willingness to listen. A good example was on display in the debate Wednesday night. Asked whether the children of illegal immigrants should be able to pay the reduced college tuitions reserved for Massachusetts residents, Patrick began by conceding it was "one of those issues where both sides have a point." But then he stepped viewers through his logic, helping them understand why he supports the idea. More notably, Patrick took pains in the debate to praise his Republican opponent, Kerry Healey, several times when she offered good proposals. It was a remarkable display of civility given Healey's repeated efforts to drag him down. We have seen where the politics of division and vilification can lead us in Washington. We surely do not need more of it here. In fact, it has been deeply affirming to see voters reject the political tone set by the Republicans in this campaign, at least so far. Healey's lurid attack ads and her dismissive attitude toward opposing views have turned against her -- a healthy portent for the state. At times in this campaign we have worried that Patrick's policy proposals were not detailed enough, and that if he won without an explicit to-do list he would lack a mandate to govern. But perhaps the new approach Patrick brings to politics -- a collaborative, consensus-building leadership style that assumes the best of people -- is his mandate. If he comes into office with the voters' strong support for this kind of governing, he could change the dynamic on Beacon Hill in profound ways. "We have got to have the resources for the shared responsibility of citizenship," he said, explaining why he resists the no-new-taxes gimmick. Of course it's the taxpayers' money, he went on. "But it's also their broken road. And it's their overcrowded school. It's their broken neighborhood and broken neighbor. So it's not this idea that people earn what they earn and have no responsibility for the Commonwealth. We have a responsibility, in addition to personal responsibility, to take charge of shared responsibility." Massachusetts desperately needs a return to such values. Our choice for governor isn't even close.